Thursday marked the beginning of this year’s SummerWorks Festival, and the first show I had the pleasure of seeing was Goombay Productions’ Women Who Shout at the Stars. 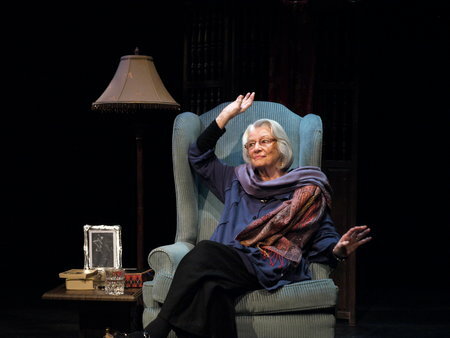 This one-woman show, written and performed by Carolyn Hetherington, is truly heart-warming. It tells the stories of somewhat ordinary women who had an extraordinary impact on Hetherington’s life and offers insight into her own life and relationships to these women. It is, in a word, lovely. Hetherington, who is in her 80s, was encouraged to write this, her first show, by playwright Judith Thompson. Thank goodness she did. The stories are definitely worth telling and her way of telling them is delightful and lulling in the best way. The women she portrays – herself, her mother and her nanny – take the audience on a journey through years filled with love, loss, song, dance, war, death and everything in between. Hetherington switches back and forth between the three characters with ease, with a simple shifting of a purple scarf and a slight change in voice and physicality for each. The set, though simple, creates a very peaceful, intimate atmosphere, which compliments the storytelling perfectly. Becky Gold’s Sound Design also sets the mood with catchy pre-show music, and great song choices throughout. The music helps in transporting Hetherington and the audience to very specific places and times. It was so nice to hear the stories of real women – women who loved, lost, hurt and struggled just as we all do – through the eyes of someone who obviously cared very deeply for them. Nicer still was realizing that they had made an impact on someone, as we surely all strive to do. Hetherington’s personal connection to these women was evident and compelling, and her respect and love for them shone through in each anecdote, quote, pearl of wisdom, and remembrance. The show made me realize how many stories are out there, just waiting to be told. I think anyone who goes to see this show – and I would recommend that you do – will leave feeling reflective and moved. Some might even be spurred on to write a play of their own. As this show and its author prove, it’s never too late to share stories, and it’s never too late to start living.